On the heels of Heroscape Marvel: The Conflict Begins, and Collection 7: Fields of Valor (Both due in July), comes Master Set 2: Swarm of the Marro. This new Master Set includes everything you need to start your own adventures in the Heroscape world of Valhalla! 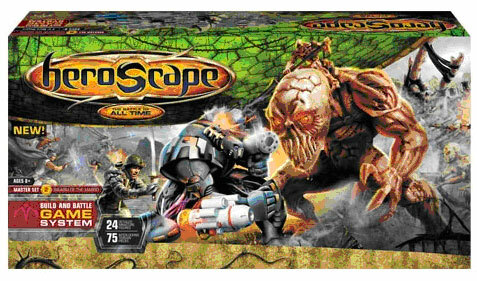 There are 2 new Terrain Types: Swamp & Swamp Water, as well as more Grass, Sand, Rock, and Water tiles to add to your existing Heroscape battlefields. Also included in the set are 7 Unique Heroes, and 3 Common Marro Squads. However, the big news is the inclusion of the Marro Hive. The Hive has special powers directly relating to Common Marro Squad figures, so stock up on those Marro Drones! Having all the master sets is essential. The marrow can be a very tough army to stop if played well, but having them and the hive is awesome.